The hassles and obligations of being an adult often make me wish that I was still a child growing up in my beautiful Puerto Rico. A wise educator once said: “It is not that men quit playing because they grow old but men grow old because they quit playing.” WOW – there is so much truth to that statement. It is not a coincidence that my favorite memories bring me back to a rural neighborhood of Puerto Rico: the streets, the school yard, and a nearby rundown basketball court with concrete floors, no nets, and rusty metal boards. In these places, I learned to play, to be active, to socialize, and to become a pretty good athlete. I like to tell people that I was a pretty good athlete since there is no way to refute my argument unless you do some extensive research. Let’s face it – nobody has time for that so just take my word for it. Back in the good old days, my mom would kick me out of the house after breakfast and allow me back in the house for dinner. I was glad to be out of the house, since it meant that I was getting an opportunity to play and be active. My favorite activities were basketball, baseball, hide-and -seek, and wooden car races. My friends and I used to make wooden passenger cars with wheels made out of ball bearings from old cars. Looking back, this was not the safest way to play but it kept everybody in shape, since we had to push the 50-pound car up the hill to get a good 30 seconds of an adrenaline rush. It was totally worth it. My brother and I owned an ATARI 2600 console with a PAC-Man game. If you have to ask “What is an ATARI 2600 video console?” then you are probably too young. I won’t hold that against you. The video game console was not popular for me. One of the reasons was because my mom and brother were so much better than me, but the main reason was because I enjoyed being outside playing and scraping my knees and elbows. After school, my ritual involved getting rid of my huge backpack, eating a snack so fast without wasting time chewing, and then changing from my school uniform to basketball shorts, a t-shirt and my Shaq Attack Reebok air pumps. The main objective was to get to the basketball court as fast as I could. On our play time, there was no structure, no set rules to adhere, no time limit, and everybody was welcome to participate. We used our creativity and imagination to play, to be active, but, most importantly, to have fun. I am positive that a lot of us had similar memories growing up. Can we say that our kids are having the same experiences and opportunities to play, have fun, and be a kid? Let’s give our kids an opportunity to play and have fun the same way I did by participating in the second annual Global School Play Day for students in schools around the world. This year’s event will be on February 3rd. The first GSPD was a huge success and 65K+ students from 6 continents participated. Spread the word through social media using the hashtag #GSPD16 and following the GSPD Facebook page. Educate the students, parents, colleagues, and administration about the benefits and necessity of play. Allow your students to spread toys out around the room and just PLAY! Don’t organize anything for your students. Don’t tell them how to play. After the event, be sure to share your pictures (parent consent needed), ideas, and reactions. Follow the links below for more information and instructions on how to sign up. Another wise educator said: “You can know more about a person during an hour of playing than a year of conversation.” Let’s play and be safe! I too, was part of the video games age. Fortunately, my grandma had a forest in her back yard which was an outdoor paradise. It is so important that playing outside continues to be part of every kid and person. You are right Bob. We are very fortunate to have such experiences. 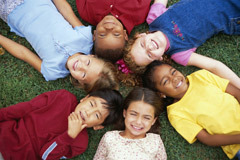 Is important to create opportunities for kids to play and allow them to create and structure activities for play time. I believe this behavior will carry on during adulthood with the end result of a healthier society. What a great reminder. I grew in the era of staying outside until the street lights came on, then you came inside along with the video age of Atari. Keep sharing your experiences with those you love and we can only hope the next generation will revert back to some history when the imagination ran wild and changed as the neighbors dog showed up. Thanks for your comment. I’ll keep playing and sharing my experiences. There is always hope. I believe that there might be some benefits to some video gamming but playing time should not be compromise.